Power Consumption: 8 Unit Per Min. Production Capacity: 175 pcs. /min. Production = 175 pcs. / min. 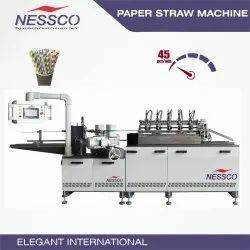 High Speed- Paper Starw making machine avaliable. Delivery : Within 7 Days. We provide high quality Straw Pipe Plant. We at Neelgiri Group are the well known suppliers of Straw Making Machine , which are well known for there quality and services . - Stable and fastest speed 40-50m/min.